Some underrated players in the AFL starred in Round 8 to force their way into the Team of the Week. The most unheralded small defender in the competition took on the game’s greatest small forward and came up trumps. Playing on Eddie Betts, Jetta conceded just nine touches and two goals, racking up 17 possessions and taking five marks in the process. Part of a very disciplined Melbourne back half that helped put the Crows to the sword on Saturday night. Frost went toe-to-toe with Taylor Walker and while the Adelaide skipper managed 2.2, his influence was stifled. Frost provided a lot of rebound with 18 disposals, four marks and five tackles. 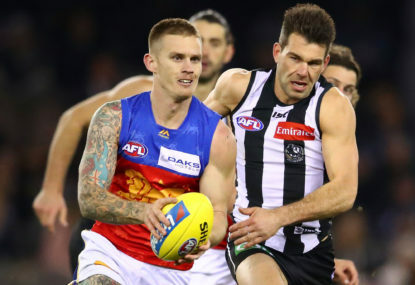 Conceding ten centimetres and a considerable amount of weight, Jonas took on Gold Coast superstar Tom Lynch in the Power’s clash in Shanghai on Sunday. In a superb performance, the former rookie restricted Lynch to a paltry nine disposals and one behind. Not too many can say they have done that. The Eagles’ skipper was a rock in defence on Friday night, amassing 28 possessions and taking six grabs. Provides a steady influence and always makes his kicks count. Took on Sydney megastar Lance Franklin fresh off an eight goal haul the week before, and kept him to a late major (albeit flukey) and very little influence in an entertaining and spiteful match-up. Arguably the best of the banned players that returned this year (along with Paddy Ryder) and that’s saying something considering he had to battle injury to get to where he is. On Saturday night against the Crows, Hibberd amassed 34 disposals and took eight marks while matched up on dangerous playmaker Tom Lynch, who didn’t trouble the scoreboard and had just 16 possessions. Massive tick. 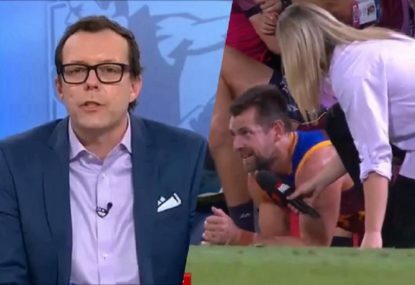 The West Coast speedster must have worn his invisible cloak to the game against the reigning premiers on Friday night, as no Dog went near him. Gaff racked up 35 disposals at 85 per cent efficiency, took 15 marks and kicked a goal in a fine display. Like Gaff, Kennedy seemed to avoid any opposition attention on Sunday against North Melbourne, putting in a superb first half that saw the Swans power ahead. 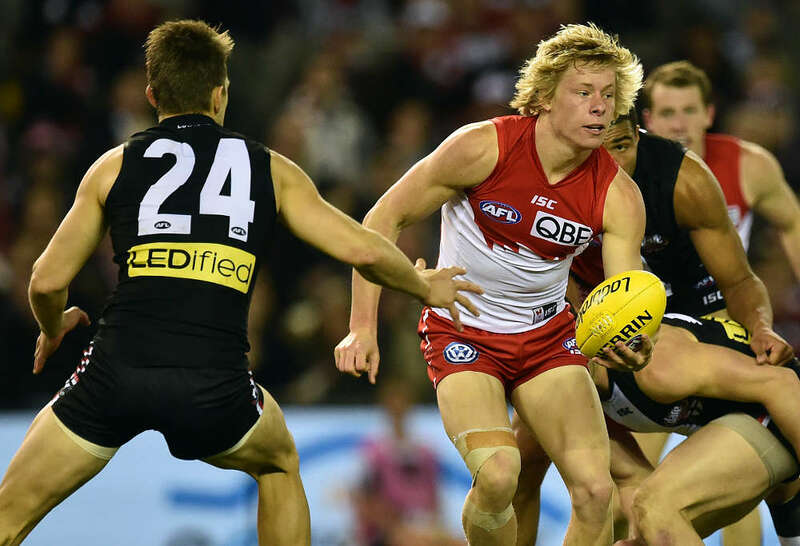 His output was subdued somewhat in the second, but the damage had been done, with the Swans’ skipper amassing 37 touches, 17 of them contested, winning nine clearances, making six tackles and booting a goal. 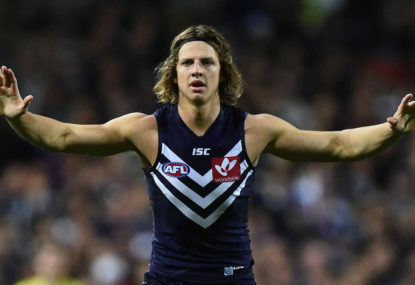 Has filled the hole in the Freo midfield left by Stephen Hill’s hamstring injury with aplomb, and on Sunday had it all his own way against the Tigers. Walters was instrumental in Fremantle’s win, gathering 38 disposals, 15 of them contested, taking seven grabs and laying four tackles. It could’ve been the best performance of the round if not for three missed shots at goal. The young gun was at his best on Sunday against the Roos, racking up 25 touches, taking nine marks, laying four tackles and kicking two goals in a classy display. Was playing more like a modern day Tony Lockett in the first half against North on Sunday evening at Etihad Stadium. 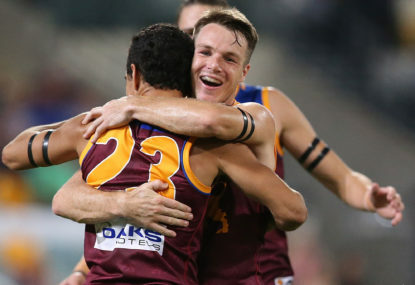 Reid finished with 22 disposals, 12 marks and three goals. Was pivotal in the Giants’ dramatic win over the Magpies on Saturday, booting six majors, including three of them in a purple patch in the second quarter. Get on him for the Coleman. It was a coming of age performance from young Billings, who utterly blitzed the Blues on Saturday at Etihad. The former number three draft pick, who was selected before Marcus Bontempelli let me remind you, had 30 disposals, hauled in 12 grabs and kicked five goals. Became the third Saint in history to have 30 or more and kick five, joining Leigh Montagna and Darrel Baldock. ‘Good’ Joe made his first appearance since Anzac Day, and what a time to do it. In a standout performance, Daniher took six marks to go with 16 touches, and he slotted five goals to help get the Bombers over the line against the Cats. ‘Razzle Dazzle’ was exactly that on Saturday night against Geelong, providing plenty of x-factor and speed in a very solid performance. Finished with 18 possessions, five marks and three goals, which isn’t his best effort in a game before, but his impact was high. Quite a controversial selection this, and one I mulled over for about five minutes, but Pedersen deserves his spot despite being obliterated in the actual ruck battle by Sam Jacobs, who notched 74 hitouts (the second-most ever recorded in a game by one player). Pedersen tried his heart out for the Demons, providing a contest all over the ground. 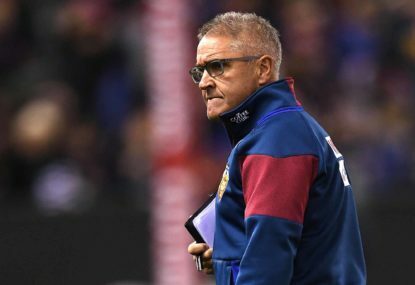 He finished with just 22 hitouts, but had 13 possessions, laid three tackles, won five clearances and kicked three goals. Is having a standout ruckman really that important? The young Bomber is quietly having an outstanding year and that continued on Saturday night against Geelong. Merrett racked up 33 disposals, took five marks and laid a huge 12 tackles. Compare that to his superstar opponents in Patrick Dangerfield and Joel Selwood, who had two tackles between them. 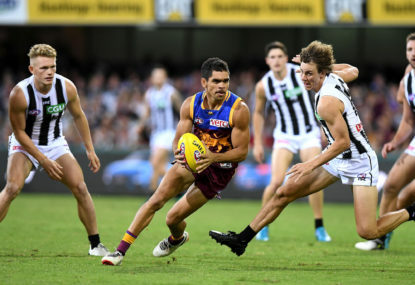 Was the best player on the ground in the Giants’ gritty win over the Magpies, collecting a huge 36 touches, 17 contested, winning seven clearances, taking six grabs, laying 11 tackles and kicking a goal. His price tag is getting bigger by the week. Just quietly, this kid is one of the competition’s best young players, and he continued his good form on Saturday against the Lions. Burton had 25 disposals at 88 per cent efficiency, while he also took five grabs playing off the back flank. If you had to pick between Seb Ross and Jack Steven to be part of your midfield, nearly everyone would have gone with the dynamic Steven in the past, but the grunt of Ross is ensuring the hypothetical becomes a much tougher choice by the week. The cousin of Jobe Watson had 31 possessions against the Blues, winning six clearances, taking six marks, laying three tackles and booting two goals. Used the ball at 83 per cent efficiency. Celebrating his 200th game, Vince went head-to-head with former teammate and good friend Rory Sloane and kept him to just 11 touches, his lowest tally since Round 10, 2010 (his third career game). Tried hard for the Magpies in their valiant effort against his old side. Adams racked up 30 disposals, half of them contested, won 10 clearances, took three marks and laid eight tackles. 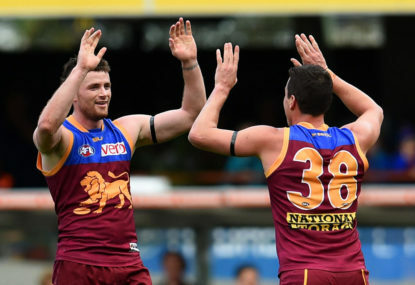 The ex-Brisbane skipper put in an outstanding performance against the Hawks in Launceston, finishing with 30 possessions, 21 of them contested, a huge 16 clearances, 13 tackles and a goal. His day was soured, however, when he left the field in the last quarter with a popped shoulder. The Demons’ co-captain was instrumental in his side’s dismantling of the flag favourites on their home deck. Viney had 30 possessions, half of them contested, seven clearances, 12 tackles and a goal. The premiership Bulldog is building into his first season with the Dockers nicely, and took a big scalp on Sunday against Richmond. Facing up to Jack Riewoldt, Hamling conceded the first goal of the day, but kept the two-time Coleman Medallist to just two more majors for the afternoon.